How much is Carlos Ghosn Worth? Carlos Ghosn net worth and salary: Carlos Ghosn is a French-Lebanese-Brazilian businessman who has a net worth of $100 million. 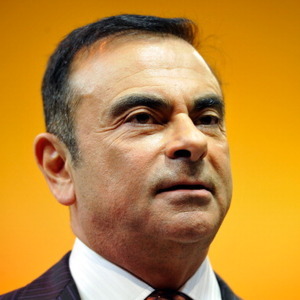 Carlos Ghosn was formerly the CEO Chairman and CEO of Yokohama, Japan-based car company Nissan. Ghosn was also the Chairman and CEO of Paris-based Renalt-Nissian Alliance. Ghosn oversaw the partnership which brought the two companies together through a unique cross-shareholding agreement. Carlos was born in Porto Velho, Brazil on March 9, 1954. He brought Nissan back from the brink of bankruptcy in the late 1990's, by orchestrating one of the decade's most aggressive downsizing campaigns, earning him the nicknames "Le cost killer" and "Mr. Fix It". Thanks to the turnaround success he pulled off at Nissan, Carlos gained celebrity status in the business world and in 2003 was ranked as one of the 50 most famous men in global business and politics. One of his biggest decisions was to spend $5 billion to build the first mainstream electric car and to ultimately turn Nissan into an all-electric fleet. The Nissan Leaf, the world's first mainstream electric car is a subject of the 2011 documentary "Revenge of the Electric Car." He has a French mother and Lebanese father. He can speak at least four languages. After graduating from college he spent 18 years working at tire maker Michelin. Carlos eventually rose to plant manager and in 1990 was named CEO of Michelin North America where he oversaw and managed the restructuring of the company after its acquisition of the Uniroyal Goodrich Tire Company. He was notable in turning around Michelin's South American operations and in 1996 jumped to Renault as an Executive Vice President. He oversaw the formation of the Renault/Nissan partnership in 1999. Ghosn is married and has four children. He was inducted into the Japan Automotive Hall of Hall of Fame in 2004. Arrest: On November 19, 2018 Carlos Ghosn was arrested in Tokyo on charges that included false accounting, tax evasion and using company money for personal expenses.